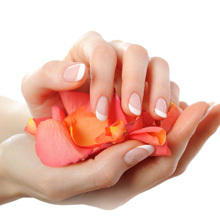 This manicure includes nail trim, shaping, buffing, cuticle grooming with cuticle soften conditioning lotion massage followed with hot towel and color polish of your choice. 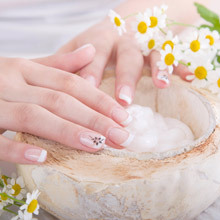 This manicure includes nail trim, shaping, cuticle grooming with cuticle soften, conditioning with candle oil massage which is made from all natural, soybean vitamin. This treatment is extremely helpful to dry skin followed with hot towel and polish color. 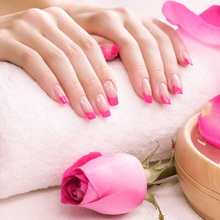 This manicure includes nail trim, shaping, cuticle and skin care, buffing, sugar scrub, paraffin dip extra hand massage followed with hot towel and color polish of your choice. This manicure includes nail trim, shaping, cuticle and skin care, buffing, sugar scrub, paraffin dip extra hand massage followed with hot towel and color polish of your choice. Extra 10 minutes hand massage. This manicure includes nail trim, shaping, cuticle grooming with cuticle soften, conditioning lotion massage followed with hot towel, and gel color polish. This gel polish stay longer than two weeks and do not damage your real nails. 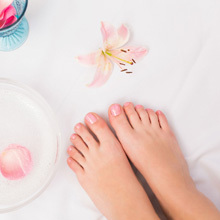 This pedicure includes nail trim, shaping, cuticle grooming with cuticle soften, conditioning lotion massage followed with hot towel, and gel color polish. This gel polish stay longer than two weeks and do not damage your real toe nails. This pedicure includes nail trim, shaping, buffing, cuticle grooming, clean the dead skin of the heel with softener and condition lotion massage followed with hot towel and color of your choice. This pedicure includes nail trim, shaping, buffing, cuticle grooming, clean the dead skin of the heel with softener. Honey Sugar Scrub will take all your dry skin off leaving you soft and smooth skin, condition lotion massage followed with hot towel and color of your choice. SOAK: Gentle softens to help relieve dry skin. HYDRATING CLEANSER: washes away surface oils, perspiration and debris. SUGAR SCRUB: buffs away dry skin and surface cells to reveal fresher, more vibrant skin. Rich moisturizer helps restore skins silky texture. NOURISHING MASK: pampers feet with moisture and nourishment to help ease fatigue and stress. MASSAGE CREAM: soothes and softens dry, rough, Deeply penetrates to help rebalance vital moisture to skins supple texture. MOISTURIZING LOTION: help to relieve dryness. Pearl powder is as much physical relief to dry; uncomfortable skin as it is an instant all day rescue from the elements. For softer feeling skin that retains moisture longer. This pedicure includes nail trim, shaping, buffing, cuticle grooming, clean the dead skin of the heel. Candle oil massage which is made from all natural, soybean vitamin. This treatment is extremely helpful to dry skin & cracked heel followed with hot towel. Include Callus remover. This pedicure includes nail trim, shaping, buffing, cuticle grooming, clean the dead skin of the heel with softener, moisturizing and exfoliating honey sugar scrub, soothing foot masque, deep sensation Hot Stone foot masssage. This will take all your dry skin of leaving you soft & smooth skin, folloowed with hot towel wrap & color of your choice. A great thing to do at the end of a long day is to kick off your shoes and free your feet? All that running, walking, lifting, socks and shoes. What they need now is the human touch, someone genuinely qualified in making them feel better. Foot massage is based on the notion that there are nerve endings in the soles of the feet that correspond to all of the organs of the body such as the liver, kidney or spleen.